One of the oldest watches I’ve got in my collection (and the first one I spent more than $100 on) is my trusty ol’ G-Shock. The reason I bought that watch – blue dial aside – is because I was enamored by the solar-powered energy cell and the atomic clock time sync. I mean, what’s not to like about a watch that (more or less) never needs a new battery and is always accurate? It’s still a trusty timepiece (it’s become my yard work watch), but I always found the atomic sync to be finicky. Well, that’s where something like today’s watch, the Citizen Satellite Wave GPS Freedom, steps in. Rather than relying on the atomic clock radio signal (of which there are three different frequencies, so you need to know which your watch can receive), the Citizen Satellite Wave GPS Freedom instead relies on the signal coming from GPS satellites up in the sky. In practice, what this means, is that the sync was very quick, and quite easy to do. Just hold down the lower pusher, it drops into sync mode, and away it goes. It could be that it’s just my atomic watch is over 10 years old now and newer atomic watches sync faster, but the Citizen Satellite Wave GPS Freedom picked uptake signal and adjusted itself in under 20 seconds. Worth noting, this was after receiving it in from New York, so I got to watch it adjust for local time, just as you would stepping off the jetway. If you’re not a traveller, this is just going to keep your watch accurate; if you ARE traveling, well, then you have a treat. Pop the watch into sync mode, and it will figure out where in the world you are, Carmen San Diego, and get your watch set properly to the local time. The watch has not received satellite signals for 6 or more days. The watch dial is being exposed to strong direct sunlight for 20 seconds or more. The time on it is between 6:00AM and 6:00PM. And, if you want to check the results of the last sync, a short press of the lower pusher will trigger that indication. The upper pusher, that you can use to check the power reserve of the battery, indicated on the sundial where day of the week shows up. Oh, and if you want to manually set your offset time (for tracking a second time zone), you do that by pulling the crown out, and then using it to move the seconds hand to the city you’re wishing to use as the offset. You also use the crown to set the Daylight Savings (On/Off) as well – pull the crown out, and then press the lower pusher to toggle. As you can see from the photos, the Citizen Satellite Wave GPS Freedom comes on a bracelet. One a bit more jangly than I’d expect at this price point, but I’ve a feeling most of the price comes from the guts of the movement. That said, if it popped the price up another $25 or so, a more robust bracelet would be nice. To adjust it, you’ve got your simple friction pin setup, and you do have two half-links (one on either side of the clasp) to fine-tune the fit. After that, it’s easy on, easy off, and you’re set for the day. Especially since its, you know, always got the accurate time and constantly charging itself up from whatever light it can scavenge. Which makes it the perfect pick-up-and-go watch, especially if you find yourself rotating through several over the course of a week. 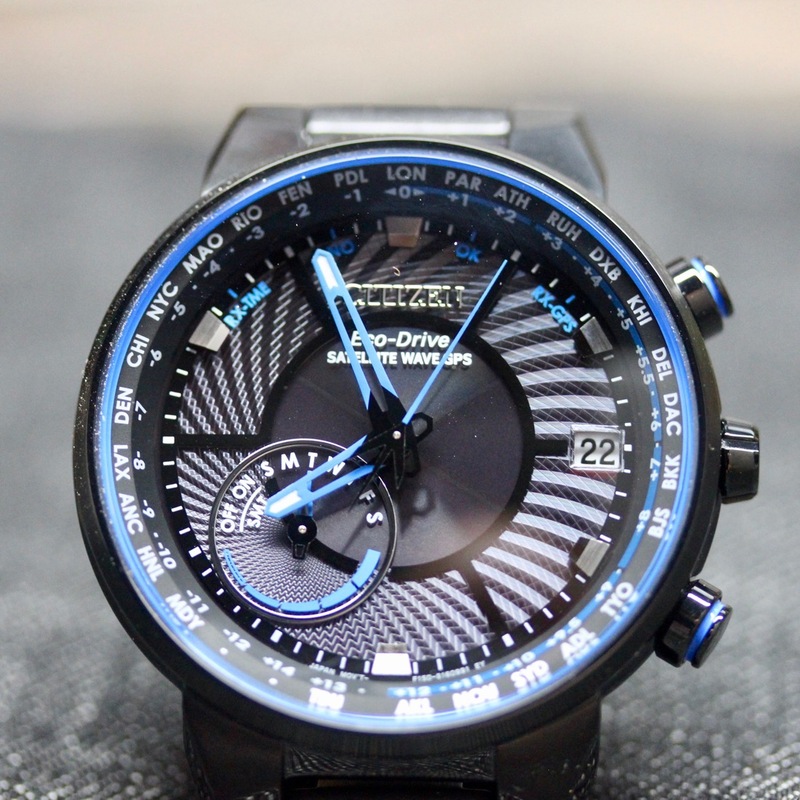 In terms of styling, the Citizen Satellite Wave GPS Freedom is definitely a good bit dressier than my old G-Shock. You can tell Citizen was going for a dressier piece, but that made for some odd choices. For instance, the lugs of the Citizen Satellite Wave GPS Freedom have alternating matte and polished surfaces. The “center link” between the lugs is glossy, as are the bevels and sides of the case. On the bracelet, though? Nary a bit of polish to be found. Again, this is something that the brand could focus on, and get the finishing consistent (in terms of gloss and matte) with what they have done on the case. You’ve also got a good bit of glossiness coming off of the curved mineral crystal. The specs don’t say anything about an AR coating, and based on my experiences with it (and trying to photograph it), if there is any it’s not the most effective stuff. Fortunately, the skeletonize blue hands stand out starkly against the carbon fiber brake disc effect that’s going on with the dial. At least during the day. At night, as you can see from the lume shots, there’s the barest minimum of luminous paint on the hands (and none to be found on the dial itself), so good luck there. Picking out the other elements – the day and date – on the dial of the Citizen Satellite Wave GPS Freedom is a simple enough affair as well. Which, for an everyday wearing sort of a watch, that’s what you want, really. It’s ease of use that’s the key, and that is something that the Citizen Satellite Wave GPS Freedom does have down. It’s just the implementation of the design that left me wanting a bit more from Citizen. Pop this into a simple brushed steel case and bracelet (or widen the lugs for a strap), shrink things down a bit, and go with a simple matte black dial – then you’ve got yourself a robust traveller. Or, better yet, go for titanium (provided it wouldn’t interfere with the GPS signaling) and you’ve got something a bit more up market, but still ready for whatever adventures you’ve got on tap.